Containerisation is a system of standardised transport, that uses a common size of steel container to transport goods. These containers can easily be transferred between different modes of transport – container ships to lorries and trains. This makes the transport and trade of goods cheaper and more efficient. The container was invented in 1956 by Malcolm Maclean an American truck businessman. International standards for container sizes were established between 1968 and 1970. The widespread adoption of containers enabled an improvement in trade and contributed to the process of globalisation. About 90% of non-bulk goods are carried in a container. 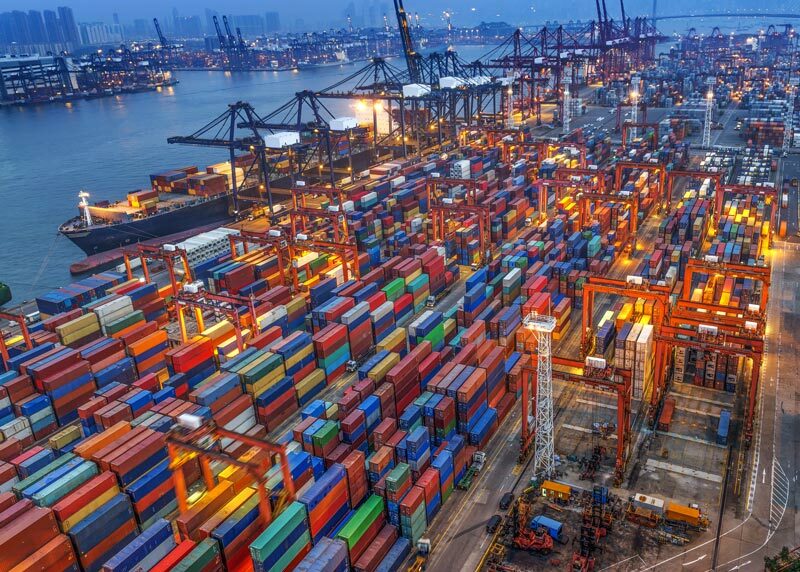 27% of containers originate from China, the world’s largest exporter of manufactured goods. The humble container may look a very simple factor of production, but it is credited with radically improving the efficiency of trade, enabling a significant boost in efficiency and economic growth. Before the use of containers, goods would be exported in a mixture of bags and boxes. It meant that loading and unloading took longer and was hard work. A large workforce was required to unload and sort the goods on arrival, before repacking for the onward transport. The widespread use of containers helped to significantly reduce the cost of trade. Containerisation is much more secure. When goods were transported loose, it was much easier for goods to go missing. There is an old joke that the wages of a docking worker were £50 a week, plus all the whiskey you could carry home. Containers made transporting goods safer and more secure. Lower incidence of theft also reduced the cost of insurance. However, as a downside, it is said containers have made it easier to smuggle contraband and illegal goods. The container principle. If you increase the surface area of a shape, the volume increases at a more than proportional rate. If you double the surface area, the volume of goods that can be transported could increase the volume fourfold. The new containers enabled an exploitation of this principle because they were larger than previous small boxes. Increased standardisation. The size of containers were standardised at a series of conferences in the late 1960s. There are many benefits of international standardisation, it helps in standardising transport, such as lorries, forklift trucks and all the paraphernalia of transport. Because containers were quicker to load, it encouraged the building of bigger ‘container ships’ Larger loads could be offloaded in a shorter time, this reduced the cost of ship transport and enabled transport economies of scale. The container may appear very ‘low tech’ but it shows that even low tech innovations can have large benefice when implemented internationally. The real strength of the container is helping to reduce costs, improve trade and increase the efficiency of international trade. Of course, there have been many other factors boosting international trade, such as lower tariffs, the growth of emerging economies, but the container has played an important role in this aspect of trade.